Rautavaara is a municipality of Finland.It is located in the province of Eastern Finland and is part of the Northern Savonia region. On the 23rd (Mon), enjoy the sand and surf at Venajanhiekka and then explore and take pictures at Tahko Farmi. Get ready for a full day of sightseeing on the 24th (Tue): explore the wealth of natural beauty at Tiilikkajarven Kansallispuisto. For photos, maps, more things to do, and tourist information, use the Rautavaara trip tool . Houston, USA to Rautavaara is an approximately 27-hour flight. Due to the time zone difference, you'll lose 8 hours traveling from Houston to Rautavaara. Expect much colder temperatures when traveling from Houston in December; daily highs in Rautavaara reach 27°F and lows reach 19°F. Cap off your sightseeing on the 24th (Tue) early enough to travel to Varkaus. Varkaus is a Middle-Savonian industrial town and municipality of Finland.It is located in the province of Eastern Finland and is part of the Northern Savonia region. On the 25th (Wed), admire the masterpieces at Varkauden Museot, don't miss a visit to Varkaus Water Tower Terrace, and then examine the collection at Mekaanisen Musiikin Museo. To see other places to visit, maps, traveler tips, and other tourist information, read Varkaus trip itinerary maker tool . Traveling by car from Rautavaara to Varkaus takes 2.5 hours. Traveling from Rautavaara in December, expect nights in Varkaus to be about the same, around 24°F, while days are somewhat warmer, around 33°F. Finish up your sightseeing early on the 25th (Wed) so you can travel to Kuopio. Kuopio is a city and a municipality located in the region of Northern Savonia, Finland. 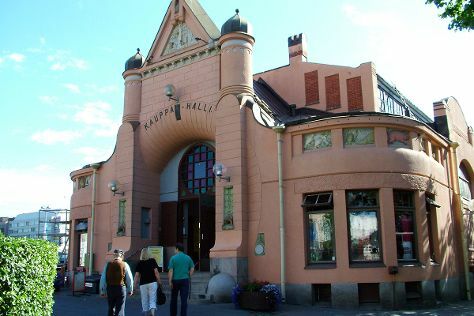 Kuopio is known for museums, fun & games, nature, historic sites, and shopping. Your plan includes some of its best attractions: ponder the world of politics at Kuopio Market City Hall, explore the activities along Valkeisenlampi, take in panoramic vistas at Puijo Tower, and take in the architecture and atmosphere at Lutheran Cathedral. For reviews, photos, more things to do, and other tourist information, use the Kuopio online itinerary planner . Traveling by car from Varkaus to Kuopio takes an hour. Traveling from Varkaus in December, expect Kuopio to be slightly colder, temps between 27°F and 19°F. Finish your sightseeing early on the 28th (Sat) so you can travel back home.